I recently stumbled across a new cookbook that I had to share with you all. No, you don’t have to be a vegan or vegetarian to enjoy these meals but a few meatless meals won’t hurt -grins. Her book is geared towards using a small crockpot/slow cooker to make small meals for two. I’m not a huge fan of leftovers so this greatly appealed to me. I’ve tried out a few of the recipes so far, easy peasy and super-delicous! So if you’re looking for something new or a holiday gift, this one’s for you. If you have a small family or are looking for better-portioned vegan meals (that don’t force you to eat chili for a week straight! 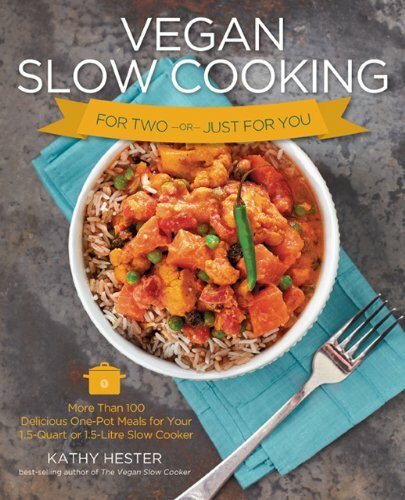 ), Vegan Slow Cooking for Two or Just for You is the perfect resource for you. Featuring recipes geared specifically for use with a 1.5- to 2-quart slow cooker, you’ll find endless meal ideas that you can make with minimal effort and maximum taste. Just prep a few items the night before or morning of, and come home to a hot meal—or side, or dessert—the moment you walk in the door! The little slow cooker is so easy to use that it makes cooking everyday a snap, so you can have a healthy variety of foods at a fraction of the cost of eating out. Inside, you’ll find a whole new world of food to fall in love with, from breakfast-y Pumpkin Polentato comforting White Bean Quinoa Gumbo to luscious Blueberry Lemon Cake. You’ll be amazed at what your little slow cooker can do! (description from Amazon). This entry was posted in Extras and tagged crockpot meals, kathy hester, meatless meals, slow cooker, slow cooking, vegan, vegan meals, vegetables, vegetarian meals by wickedgreensmoothies. Bookmark the permalink. Thanks for sharing this! I’m a huge fan of slow-cooking meals, and I’m always looking for vegetarian/vegan meals, so this is definitely one I plan to get. My pleasure! I liked the recipes so much, I wanted to share. Happy Holidays!